Preheat oven to 375 degrees F (190 degrees C). Spray a glass baking dish with coconut oil cooking spray. 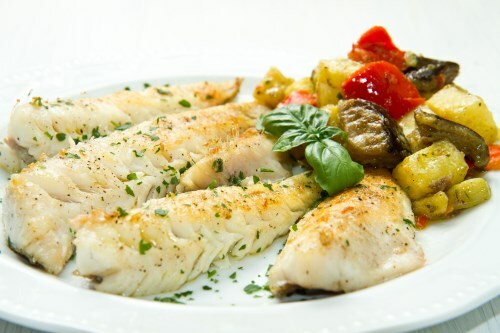 Place tilapia fillets into prepared baking dish, and bake in preheated oven for 10 minutes. Meanwhile, stir together the mustard, Worcestershire sauce, lemon juice, garlic powder, oregano, and Parmesan cheese. When fish has cooked for 10 minutes, spread with herb paste, and sprinkle with almond meal. Continue baking for another 5 minutes until the topping is bubbly and golden.